Xfrog adds six new procedural Objects to Maya. By combining these with Maya components/objects you can create a wide variety of organic models and animations using organic procedures (based on some of the building blocks of Nature). Our tools behave exactly like Maya components, so you can keyframe them and combine them with PaintEffects or Particle animations or use MEL Scripts to drive them – the possibilities are nearly endless. Branch Object – create multi-level branching structures with extensive parameters to allow you to give them a natural look and feel. Phyllotaxis Object – arrange components on an abitrary surface of revolution, according to the rules of nature (golden section). It is, for example, used in the sunflower screenshot above to arrange petals and seeds. Hydra Object arranges components in user defined specialized circular patterns. Curvature Object creates Splines which can be used as a basis for naturally curved leafs or twigs. Variation Object allows you to use and multiply different Objects with the Branch, Phyllotaxis and Hydra Objects, for example you can use different leaves scattered throughout a tree, or any sort of variations that you need for higher realism. Tropism Object lets your spline-based objects or works created with the Branch Object, all bend towards a gravity or light point. e.g. all branches bending downward in a very specific way or reaching upwards towards light. keyframe this during Growth animations. All the tools can be animated over time by varying their parameters, such as number of branches, gravitropism, phototropism, etc. A convincing flower can be built and animated very easily, or a tree can be modeled and grown. All of Maya animation curve editing features can be used, as well as MEL. For more information, tutorials and a free 30 day trial, visit the Xfrog 5 for MAYA product page. Xfrog 5 is compatible with Maya 2010 and Maya 2011. 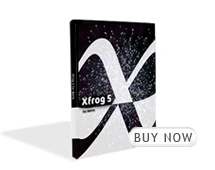 Users with Maya 2008 or 2009 recieve a key for Xfrog 4.3 with purchase of Xfrog 5. This entry was posted on Friday, August 20th, 2010 at 1:00 pm	and is filed under Press Releases. You can follow any responses to this entry through the RSS 2.0 feed. You can leave a response, or trackback from your own site. I’m a Modo, Vue and Rhinoceros user. When you release a plugin for these software? When you release a Xfrog 5 stand-alone version? now softimage is owned by autodesk, I hope you make a version for softimage. Many more sales i think. I agree with Andre. Any plans for a Softimage plugin? Way too many 3dsmax users in the Archviz field since Vray 1. This whole industry is turning around 3dsmax Can’t beleive you didn’t update the 3dsmax plugin or am I missing something ? !